By the time I entered NYU School of Law in the early 1970s, I was a product of this campaign to undermine patriotism, morality and spiritual life that had captured the hearts and minds of the cultural Marxists and their fellow travelers, who were (as the Marxists intoned) useful idiots. Let me explain. My parents were actors. My father was a Hollywood cowboy star in the 1930s. He won the box office in 1936. They were wonderful people, but not people of Christian faith. They dabbled in different philosophies, religions and metaphysics. Dartmouth, Cambridge, and finally NYU School of Law convinced me that the traditional Christian faith of the Founding Fathers was illusory and drove me into the arms of the hard left. My Constitutional Law professor was Norman Dorsen, who for many years headed the vile, left-wing ACLU. Even so, I thought both Norman and the ACLU were too conservative, so I joined the Communist linked National Lawyers Guild while studying at NYU School of Law. This prestigious law school and the other top ten had unwittingly bought into the Cultural Marxist mindset, so no one would sink so low as to read the actual US Constitution. Relativistic case law would trump any of the dead white males who had founded the country. Then, after working at the US Attorneys office and putting together the funding for five feature films, a friend challenged me to read the Bible. Halfway through the Gospel of Matthew, God called me to Christ. He opened my eyes. I became very patriotic. Morality became liberating. My spiritual life became paramount. Thus, Jesus Christ turned me from anti-faith and values to the Good News of His Kingdom, including the value of patriotism, morality and Christian faith. So, to counteract the AGENDA of the Stalinist left now trying to run the United States, we must rebuild the foundations of patriotism, morality and spiritual life. The foundation of the United States Constitution is the Declaration of Independence. Its foundation, as it says clearly, is that we are “endowed by our Creator with certain unalienable rights, that among these are Life, Liberty and the pursuit of Happiness. . . .” It stipulates that civil governments are instituted only by the consent of the governed to protect those God-given rights. Thus, the foundation of our government is not the will of King George, nor the whim of the mob, rather it is the unalienable rights given by our Creator. Without the Creator, our rights are not unalienable, and, if we forget the Creator, the government moves quickly and inexorably to lord it over us and our children and grandchildren. It is a story as old as time: power corrupts. In 1 Kings of the Hebrew Bible, Ahab and Jezebel look over their castle wall and lust after a little piece of land that belonged to poor humble Naboth. When they steal his land, however, they face the consequences of violating God’s law. Marx and his Communist buddy Engels didn’t understand that “thou shall not steal” actually protects the little guy against those who have the troops and the power. The United States Constitution, which we would not read at my prestigious law school, recognizes this. It points out that we own the land, not the government. We do not lease property and money from the government. The government does not have the right to interfere with our private ownership. One of the wisest legal minds I know is Neal Markva. One day a fire department official came into Neals’ attractive new law offices and said, “We are here to inspect.” He asked, “By what authority?” The officer could not answer, so he left and came back with the fire chief, who said, “We are here to inspect.” Neal said, “By what authority?” They came back with some paltry bureaucratic regulation. Neal took out the Virginia Constitution and asked them where did it give them authority to come on his property? 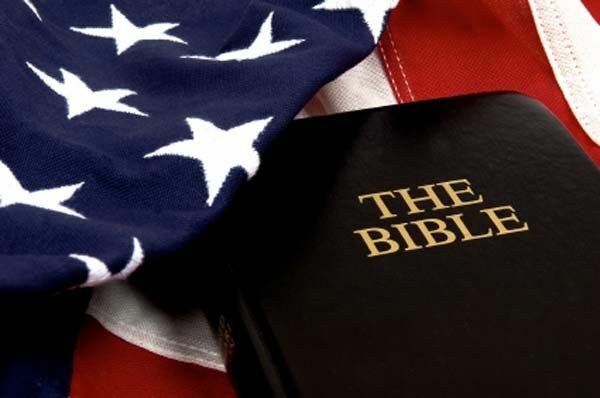 The Constitution recognizes freedom of religion, speech, assembly, the right to bare arms, the right to life, the right to a speedy trial, and much more, as part of the unalienable rights granted by our Creator. When our administration and civil government get uppity, it charges us to change, rearrange and rebuild them. It is time for us to rebuild the foundations: patriotism that enables us to live in peace and prosperity, by reading and rereading the Declaration of Independence and the Constitution; morality that frees us from theft, murder, sickness, and impoverishment at the hands of feudal lords who are the government bureaucrats, by knowing the foundation of the one true faith – the Bible; and, our spiritual life by getting to know Him who granted us our unalienable rights, so we can be free to be His children, the heirs to His Kingdom. Ben Franklin specifically erged and convinced his contemporaries to use the word “creator” not “jesus, or christ” because this nation was founded on the libertarian ideals of equalit, tolerance, a place where people of different opinions could get along without killing each other! Your conservofacist theology is as foolish as any marxist principle and frankly the american people don’t buy it. They see the reality that muslims and christians, hindus, liberals, whites and blacks,… can live in peace despite your efforts to divide the country. This is a sad attempt to dismamtle everything that makes this nation great. Theocracy is not an option for this country unless we want to end up like Iran. Interesting propoganda but your logic and evidence is weak at best, do feel free to try harder next time. Brandon, you are an AGENDA tool. it’s july 2013 & your “They see the reality that muslims and christians, hindus, liberals, whites and blacks,… can live in peace…bla bla bla” hasn’t QUITE panned out that way….jus’sayin’. Sadly, none of the candidates on the baollt have stated a clear tea policy. One can still write in whoever one wishes, however. People in the crowd at my polling place this morning kept looking at me and smiling — I was beaming all over the place. I love voting and seeing crowds of people vote.